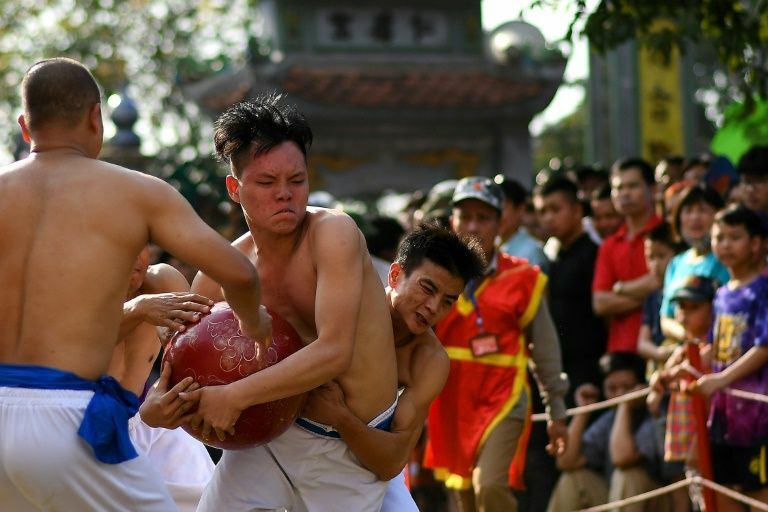 Bare-chested men in brightly coloured belts grapple for possession of a giant wooden ball at a Vietnamese festival, tumbling from corner to corner as hundreds of excited spectators cheer them on. 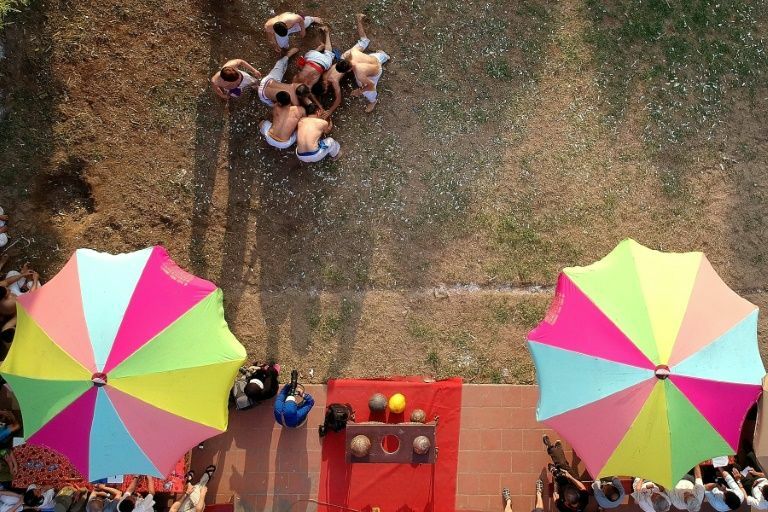 They are playing Vat Cau -- a centuries-old sport which began as a training exercise for soldiers and contains elements of wrestling and rugby. Vat Cau is the main draw of a three-day annual festival held during Vietnam's much celebrated Tet Lunar New Year in Thuy Linh village, just 10 kilometres (six miles) from the centre of the capital Hanoi. A single match has four separate teams of eight men wearing waist straps of different colours. They tussle over a 17-kilogram (37-pound) ball made from the wood of a jackfruit tree, laboriously inching it towards one of the holes dug in each team's corner. 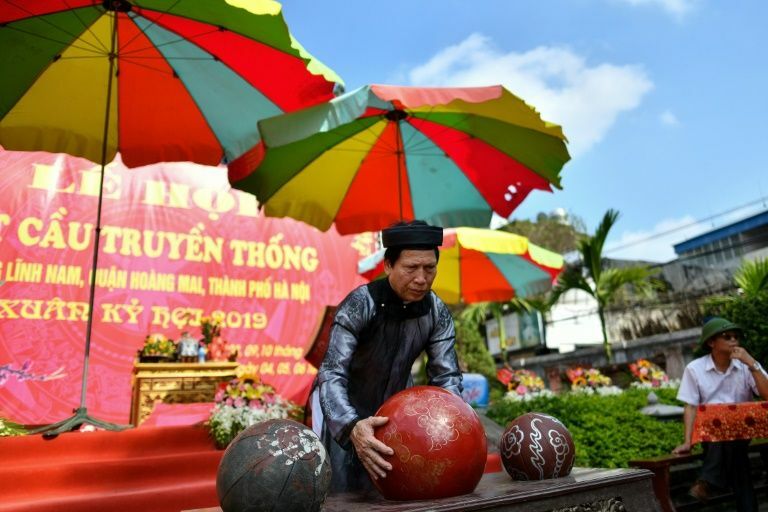 "This game is the tradition and the pride of the Thuy Linh people," Le Duc Duong, an athlete with 15 years of experience playing Vat Cau, told AFP on Saturday, the second day of the festival. Before the annual showdown at Thuy Linh's communal temple, each sportsman must train in sports like swimming, running and bodybuilding to get in tip-top shape, he added. The audience at Saturday's competition were in high spirits, laughing and cheering as a match announcer commented on the athletes pouncing on each other in the field. "Some of our athletes have a six-pack body, and some have a six-pack-in-one," he said wryly. At the end of the three-day tournament, the squad with the most points advances to the next round, and the champions in the final stage will receive a cash prize of $260 to share between them -- a small reward that gifts bragging rights to one team among the 16 competing. 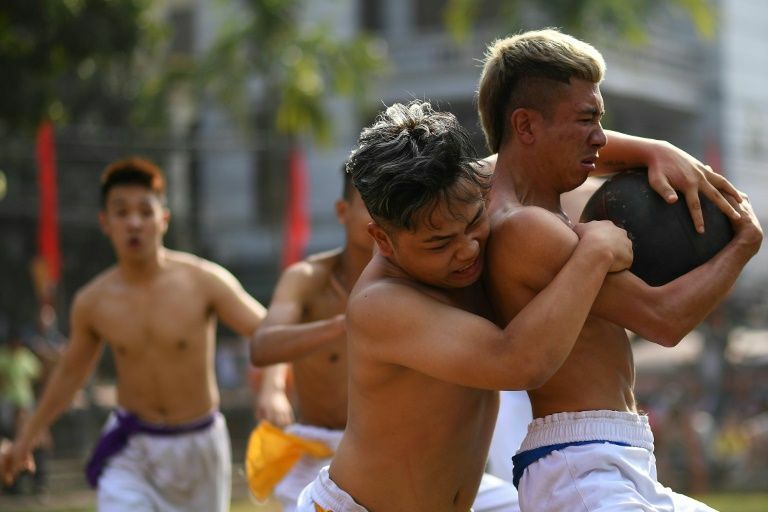 Dating back to the 11th century, the game was invented by a revered general to teach his recruits about the importance of teamwork, intelligence and strength when fighting against foreign invaders, festival organiser Le Minh Xuong told AFP. "(This game) inherits the tradition of our forefathers, which is to train the men in the village to have health and fitness for the ultimate purpose of protecting our homeland," he said. But for the players today, the stakes are not so high. "We play this game for fun actually. The prize is not important for us," 20-year-old player Nguyen The Hien, a kickboxing trainer, said. "Each year we play it and it brings joy to us."